Exclusive! A wild bunch! 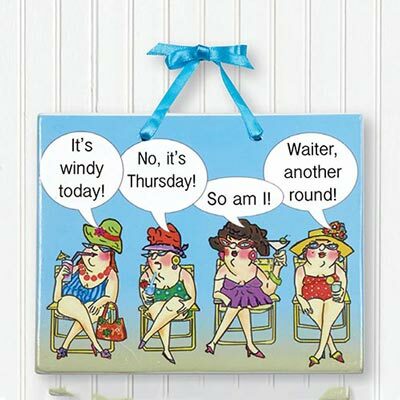 Our witty "It's Windy" plaque captures the goings on of old gals on an outing. A perfect present for the girlfriends who understand you! Ceramic with blue ribbon hanger. Imported. 6"w.
I have lots of these things in my little powder room down stairs. People always come out laughing. I purchased 4 of these to take to special friends for our 50th high school reunion. We all had a great laugh!